I really wanted to name this post: I <3 blue Balls. You know, the jars! But I didn't. Because I love you. 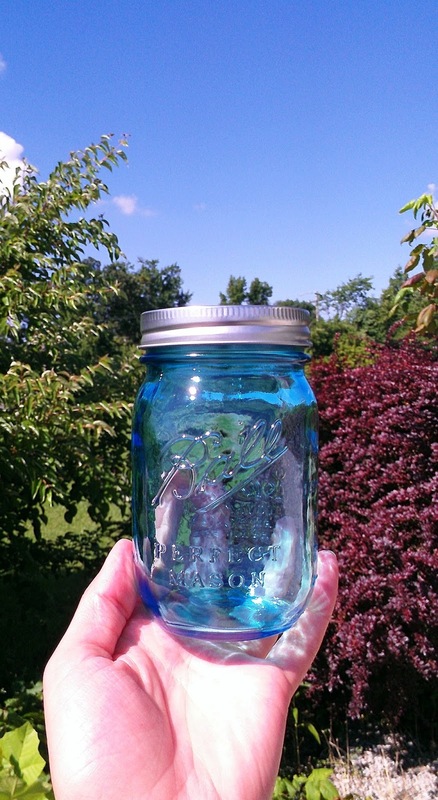 So, in other news, there is such a thing as canning swag. Who knew? Let me introduce you to my new love, Ball’s 100 year commemorative blue pint jars. We met last night, and it was love at first sight. Captain America asked me to come in the house and presented me with a giant box and a pocket knife. What did I find inside, but 18 of these beauties all packaged up and waiting to be my partners in crime! Hats off to Captain America and his ability to pick up and act on my weird wants. All it took was me mentioning seeing them in my favorite blog, Chickens in the Road and they magically appeared! Remind me to pickle him something next week. That boy is going to drown in jam and chutney. I mean affection, affection! *sigh* Food is "intense like", right? Clear glass jars seem so plain next to them. I mean I can can tomatoes and they’ll look purple! Green beans are going to be SO green this year! My pantry is going to be a freaking work of art! I can hardly wait to try them. It’s a good thing that tomatoes are ripening, cucumbers are out in full force, and the beans are blooming; because next week, next week, these babies are being put to the test! Can you see heaven parting, and light shining down? Is that only in my head?